The Minister Delegate at the Presidency in charge of Defence, Joseph Beti Assomo watched the rehearsals at the 4 Airbase in Yaounde on May 15, 2018. Cameroon’s defence forces in the nation’s capital, Yaounde are preparing to put up a wonderful parade during the march past at the 20th May Boulevard on the occasion of the celebration of the 46th edition of the country’s National Day on Sunday, May 20, 2018. It was with the objective of ensuring a thrilling parade by foot soldiers in front of the Head of State, Paul Biya and his special guests on celebration day that the National Gendarmerie, Army, Navy, Airforce, Firefighting Brigade that make up Cameroon’s defence forces as well as the Customs have embarked on rehearsal drills. The last rehearsal at the Yaounde 4 Airbase before general rehearsals move to the ceremonial ground at the 20th May Boulevard took place on Tuesday, May 15, 2018. The Minister Delegate at the Presidency in charge of Defence, Joseph Beti Assomo flanked by the Secretary of State at the Ministry of Defence in charge of the National Gendarmerie, Galax Yves Landry Etoga, Secretary of State in the Ministry of Defence for Veterans and War Victims, Koumpa Issa and other senior officials watched the rehearsals. The Chief of Defence Staff, Lieutenant General René Claude Meka gave instructions to block commanders who have to transmit to the troops in the different blocks to ensure a faultless performance. Speaking at the end of each of the two sessions of the march past practice, he pointed out corrections that have to be done with regard to foot steps, spacing between blocks and alignment. The instructions were indeed received particularly by the Commander of the troops during the 2018 National Day march past, Brigadier General Nouma Joseph and the second-in-command, Colonel Azew Landry of the National Gendarmerie. Information from the Communication Division of the Ministry of Defence indicate that President Paul Biya’s special guests during the march past at the 20th May Boulevard will be a contingent of the Nigerian army. 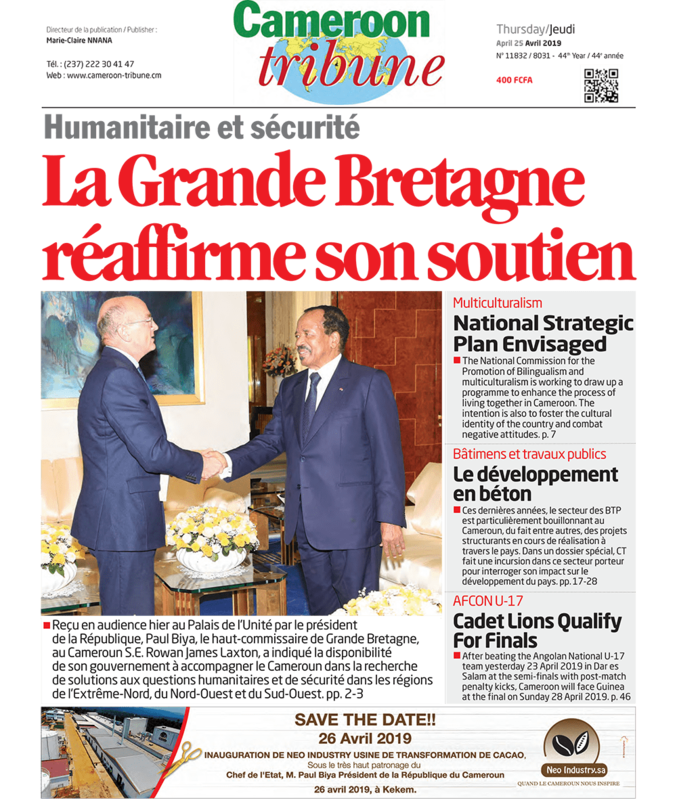 On specific innovations in the military parade in the 2018 National Day celebration, close sources said it comes at the time the country’s Joint Military Regions have increased from four to five with the creation of the fifth Joint Military Region that regroups the North West and West Regions and also the increase in the Gendarmerie Regions that have also increased from four to five still with the regions cited above making up the fifth. All these are intended to adapt to the security situation in the country and the world at large. The celebration also comes at the time Cameroon’s military has got two CESSNA 208 B aircraft from the US government to reinforce surveillance, reconnaissance and intelligence mission in the war against Boko Haram.